Dystopias – why do we love them so? We get more than our fair share of them in video games, but when the audience feels like they’re living in Blade Runner already, how do developers keep things feeling fresh? If you’re Sectordub, you ditch the grimy neon and rain for a primary-coloured 2D world and make your robots cute and cloud-shaped. 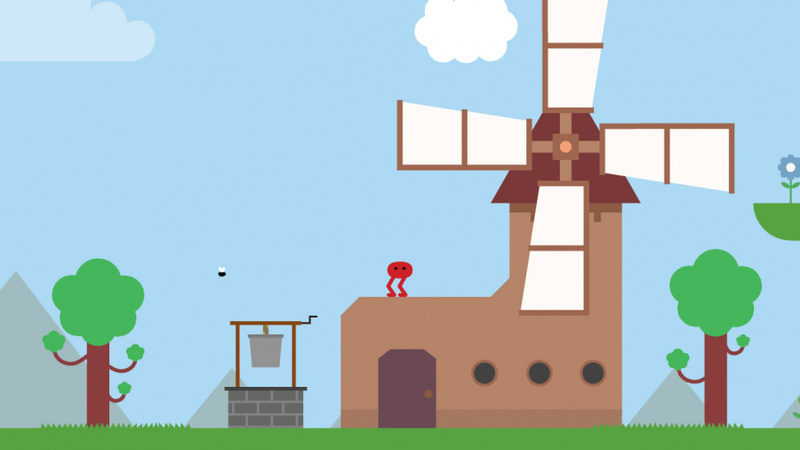 Pikuniku is a primary-coloured platformer with light exploration and puzzle elements, and although the blurb assures us it’s dystopian, you’ll bound through this jaunty world with a grin on your face. You control Piku, a red cave-dwelling ‘beast’ according to local legend, although upon actually meeting him the villagers discover he’s harmless and lovely. They enlist him to help deal with the industrious Mr Sunshine, a jovial pink dude harvesting the village’s corn crop in return for ‘free money’. What seemed like a good deal at first turns ominous when Sunshine Inc. billboards pop up and he sends his robot minions to collect more and more resources across the world. 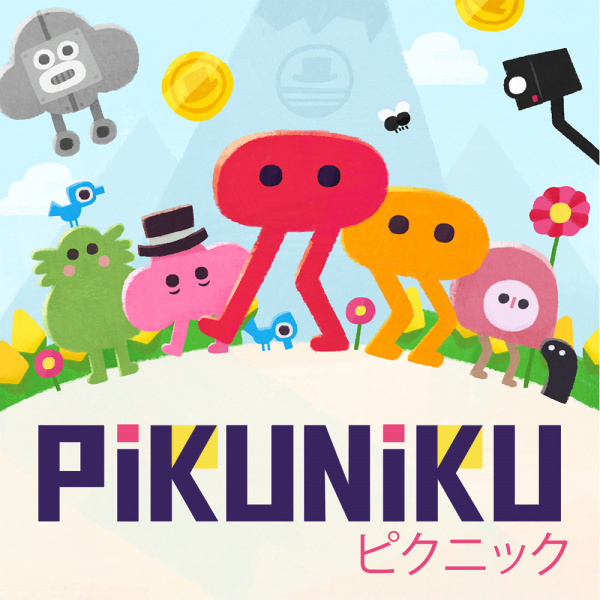 The eponymous Piku (joined by yellow/orange clone, Niku in co-op levels) is likeable despite being little more than a red pill with gangly legs. The animation lends every member of the cast an adorable clumsiness as their legs struggle to keep up with their bodies. Jump is on ‘B’ and holding ‘A’ turns Piku into a legless ‘pill’ which rolls quickly over flat surfaces and squeezes into small spaces. You’ll journey through valleys, forests and mines on your adventure, dropping in on inhabitants in their various abodes and buying swag with the coins you collect. Different ‘hats’ enable you to make progress by, for example, watering a plant to create a platform or drawing a picture. Hats are accessible via a menu on the left shoulder buttons, with a small inventory of collectible items on the corresponding right buttons. The majority of puzzles involve kicking things with ‘Y’ (buttons, rocks, robots) or pushing objects onto switches to proceed. You swing from hooks by lassoing them with a leg and the floaty physics are forgiving enough to throw yourself around without too much worry. The joy of the game comes from exploration – finding ‘hidden’ passages behind walls with zigzag lines (containing trophies and other goodies) and speaking with NPCs with their endearing lowercase speech bubbles. Comical boss battles follow the three-hits-and-done formula and a handful of minigames (including a fun little rhythm game) help fulfil the retro call-back quota. 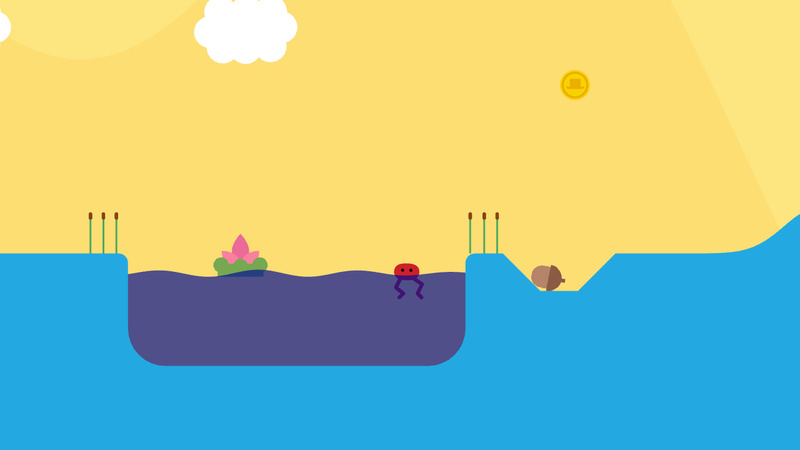 You’ll come across more treacherous areas later on, but even the ‘dungeon’ areas are extremely forgiving – Pikuniku is the most accessible, approachable game we’ve played in a long while and with persistence even the greenest of gamers should have no problem getting through it. 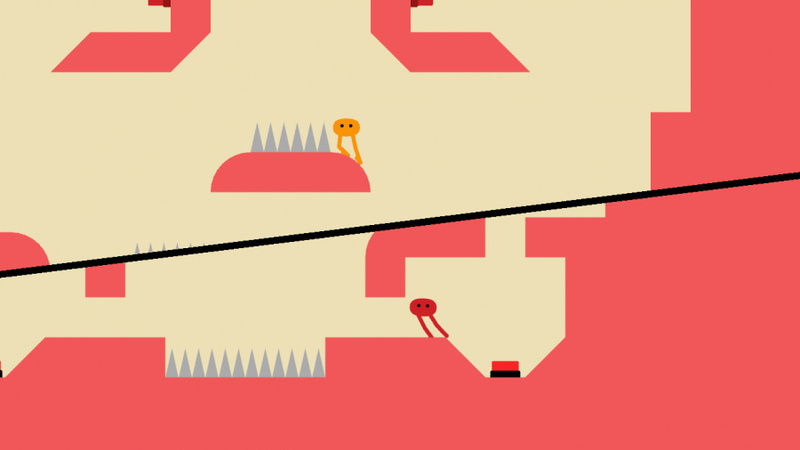 That’s not to say it’s without challenge, but generous restart points and forgiving level design show that Sectordub is aiming to charm players of all abilities rather than craft real brain-teasers, and on those terms Pikuniku succeeds with flying colours. And there are certainly plenty of colours flying! 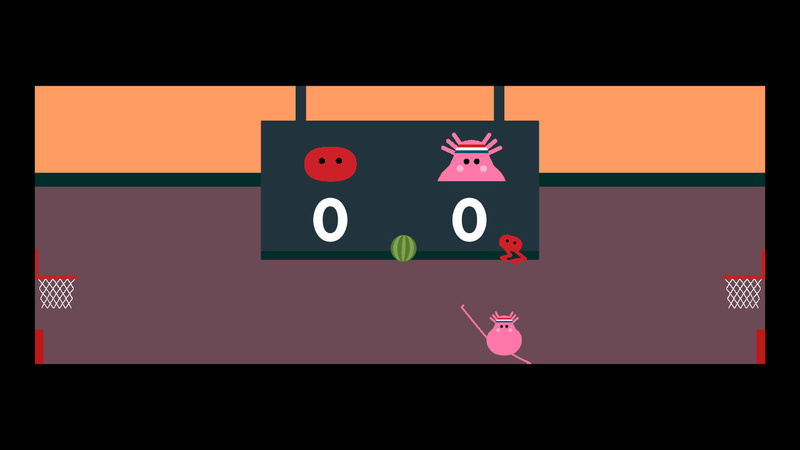 The shades and shapes you see in screenshots look lovely in both docked and handheld modes, and Pikuniku owes something to PSP classic LocoRoco in the look-and-feel department, with simple characters and buoyant, elastic animation really popping onscreen. We were surprised to see a couple of framerate dips – it seems the Unity engine underneath is doing more work than the surface might indicate – but it wasn’t a consistent problem. The music is as cheerful as the visuals, although it might grate on the nerves of anyone in your vicinity who isn’t actually playing the game. Local co-op is self-contained from the solo adventure, with nine different levels, plus a surprisingly addictive basketball minigame. Piku and Niku must negotiate their way to a boat at the end of each stage, sometimes racing in little cars to get there, other times tethered together by a rope. It’s all single screen until players get too far apart and the screen splits down the middle, with the dividing line rotating depending on your exact position in relation to each other – a neat effect. 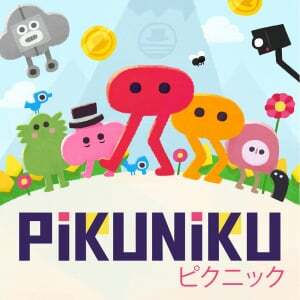 The ability to kick your partner results in the same brand of hilarity we experienced with that other Switch puzzle-platformer, Snipperclips, but where that game can get frustrating in later levels, Pikuniku rarely threatens to damage relationships like some of Switch’s other couch co-op gems. The solo adventure took us about four hours, although with several collectables to go back for. The co-op levels are separate – perhaps a couple of hours in total, depending on the ability of your partner. Each one offers a completion time, but there’s not a whole lot in terms of replay value, which for some might warrant knocking a point off the score below. For others, though, its gentle gameplay and colourful co-op experience may be worthy of an extra point, especially as a game to enjoy with young kids. Regardless of where you fall on that scale, you’re sure to enjoy your time with Pikuniku. We struggle to recall a dystopia quite as cheerful as the one found in Pikuniku. It’s a short game, but one packed with heart and imagination, with a great single-player component and excellent couch co-op that can genuinely be enjoyed by anyone. It makes us remember the fun we had cutting pieces from our friends in Snipperclips, but where we occasionally hit a brick wall with that game, Pikuniku sidesteps frustration in favour of a breezy and charming adventure; a perfect salve if you need a break from the backlog, but don’t dive in expecting endless hours of gameplay. Literally anyone can enjoy? Even the blind? I so want this weirdness ever since I saw the first demo for it. I was hooked. Will wait out a little just in case of physical, but will probably cave when it's on offer. @ReaderRagfihs Don't forget newborn babies too! I don't understand the obsession these days to (mis)use the word "literally" in every sentence. I literally hate overusing the word "literally" and using it wrong! @nab1 just wait until you start seeing the overuse of 'pre' everywhere. You won't be able to read another day without getting at least slighty annoyed. Pre-order, pre-heat, pre-recorded, pre-assembled, pre-loaded. This reminds me of Freaky Forms, for some reason. @UmbreonsPapa @IronMan30 Yeah, I thought of Freaky Forms too, and Pikuniku also reminds me of Loco Roco and Docomodake in some ways. I actually went ahead and pre-ordered this one with the 10% discount as I was pretty confident it would be right up my alley, so I'm glad to see it got such a positive review. Bah. Another game I hope we see a physical copy of. LocoRoco was a masterpiece... largely forgotten because Sony says ×+#[email protected] anything portable. This is the spiritual successor I need. The Switch is off to a great start. This game looks amazing. I wish LocoRoco and/or Patapon weren’t lost to Sony. Looks interesting, will add to my wishlist. After seeing Alex play this, I really wanna give it a try. So happy that this gets a recommendation! I'd been hoping it would be all the weird things it was promising to be. I can wait to see if it ever goes on sale, but I am very interested. Too many games in the queue! Locoroco on Switch... would be pure bliss. Had this one pre ordered:) so happy to hear it turned out as I hoped. Gonna load it up right after I beat Undertale!! This game is currently free with Twitch Prime (which you have if you subscribe to Amazon Prime), so you can try it out before buying. It's very reminiscent of the old Dizzy games, with the simple yet obscure puzzles, the bonkers movement physics, and the mini open world. But that also means the gameplay is quite limited. "A perfect salve if you need a break from the backlog, but don’t dive in expecting endless hours of gameplay." Those are the pretty much only games I'm interested in anymore. Stupid backlog and/or lack of free time. At any rate, this game sounds amazing. @ReaderRagfihs I would say so considering Calum Bowen made the soundtrack. Genuinely love the look of this game. Definitely one to pick up when I get a Switch. No mention of Don't Hug Me, I'm Scared in this review was a mistake. Almost slipped by me, thankfully Eurogamer mentioned it in their review. Lol at comments moaning about 'literally'. Calm down there, professors. Weird game, but not weird enough... probably because it's not made by Japanese.